Malvika, Class 11th student of Step by Step School, Noida has been learning Bharatanatyam from Smt. Marie Elangovan and Elangovan Govindarajan for over 10 years at Parampara Centre for Indian Classical Music and Dance. 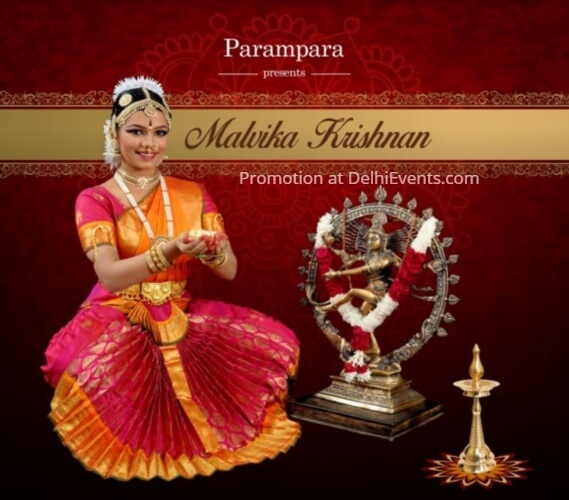 As a member she has performed at various prestigious venues at Delhi and NCR. Currently she is perusing a degree in Bharatanatyam from Pracheen Kala Kendra and has completed the fourth year examination, Visharad 1. Aspiring to take up the career in Business Management, Malvika intends to continue dancing in the years to come as dance is the integral part of her life and brings unparalleled joy to her. Gurus are Marie Elangovan and Elangovan Govindarajan. Marie Elangovan is an accomplished Bharatnatyam Exponent and a noted choreographer. Marie is an M.A gold medalist in Bharatnatyam from Bangiya Sangeet Parishad, Rabindra Bharati University and the recepient of many achievement awards. Elangovan Govindarajan is a widely acclaimed singer, music composer, lyricist and nattuvanar. He is the Director of Parampara Centre for Indian Classical Music and Dance where he teaches Carnatic Music and has been bestowed with many awards and titles.